A mason uses bricks, concrete blocks, or natural stones to build structures that include walls, walkways, fences, and chimneys. Depending on the building material in which they specialize, these workers might be called brick masons, block masons, or stonemasons. Brickmasons are sometimes referred to as bricklayers. There were approximately 292,500 masons working in the U.S. in 2016. Most of them were cement masons and concrete finishers. Assist in building layout, framing, sheathing, and roofing structures. Use equipment and tools to safely perform basic construction tasks. Correct any safety hazards and report them to the foreman. Communicate any more serious safety issues. Tear down, rebuild, and point chimneys. Cut openings into walls, ceilings, and floors constructed of masonry materials. This occupation doesn't require any particular post-secondary education, but you will need training. Apprenticeship: You can train to work in this occupation by completing a three- to four-year apprenticeship. Apprentices must complete about 144 hours of related technical instruction and 2,000 hours of paid on-the-job training each year. They learn about blueprints, building code requirements, mathematics, safety requirements, and first aid procedures. Upon completion of the program, you'll be considered a journey worker, which means you can do your job unsupervised. Education: You must be at least 18 years old and have earned a high school or equivalency diploma to be eligible for an apprenticeship. You should also have a valid driver's license and transportation because travel is often required. You should have several essential qualities to succeed at becoming a mason. Physical fitness: Masons must regularly lift very heavy equipment and material, such as blocks that weigh more than 40 pounds. You'll have to keep up a steady pace as you lay bricks all day. Manual dexterity: You'll have to apply smooth, even layers of mortar and quickly set bricks. Creativity: You'll have to shape stones into attractive and functional structures. Reading skills: You must have an ability to read and comprehend instructions including safety policies and procedure manuals. The job outlook for masons is excellent. The U.S. Bureau of Labor Statistics predicts employment will grow faster than the average for all occupations through 2026, at about 12%, although this can vary by specific occupation within the industry. A growing population will demand new construction, and existing structures must be kept safe and are often aesthetically upgraded. This is strenuous work. It involves standing, bending, and kneeling for extended periods of time, as well as heavy lifting. Masons run the risk of injury from cuts and being struck by heavy objects, although wearing safety gear can prevent against much of this. Even indoor work can be dusty and dirty. Outdoor work can expose you to bad weather, but much of this type of work is by necessity aborted, at least temporarily, under circumstances like heavy downpours. Most jobs are full-time and often include overtime work. Schedules can be erratic during cold weather months when there isn't a lot of building taking place. Terrazzo masons, those who do decorative work, often find that they must do their work late at night and before dawn when businesses such as restaurants are closed to customers. Apprenticeship programs are usually sponsored by unions or contractor associations. Contact the local union that represents masons to learn about apprenticeship programs in your area. 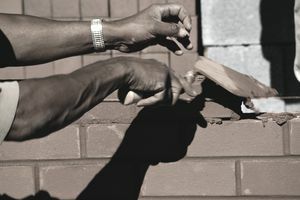 The International Union of Bricklayers and Allied Craftworkers maintains a list of locals that are part of that organization. You can get training through a one-year program at a technical college rather than perform an apprenticeship. The credits you earn can count toward an associate degree.